Jon Stewart: Will Bill O'Reilly Buy A $4 Shrimp? "Would you pay $4 for a shrimp if it were wrapped in a $10 bill—netting you a profit of $6?" 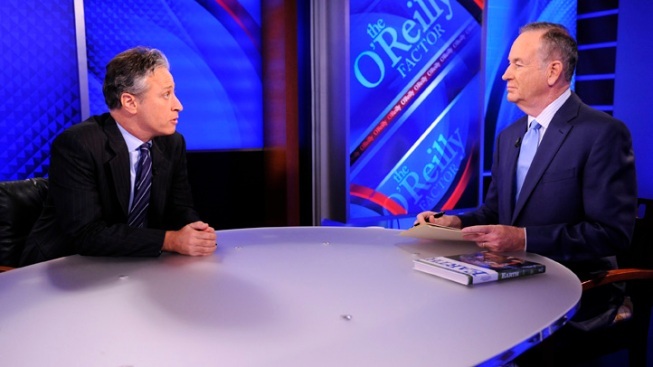 Comedy Central's Jon Stewart and Fox News' Bill O'Reilly tape an interview in September 2010. This week the General Services Administration chief resigned after it was reported that her office spent exorbitant sums of money on taxpayer-bankrolled conferences. One of the most excessive expenses: $4-a-shrimp appetizers. Bill O'Reilly was outraged by the lavish spending-sprees. On his Fox News program, O'Reilly said that, despite his own personal fortune, he would never shell out cash for such an expensive item. "When I walk into a place and see an outrageous price tag, I walk away," he said. "I'm not going to pay $4 for a shrimp—ever." Famous last words? Think again. On Thursday's edition of "The Daily Show," Jon Stewart—also indignant over GSA's decadence—challenged O'Reilly to a game: "Can You Make Bill O'Reilly Pay $4 For A Shrimp?" Despite Stewart's generally antagonistic relationship with the conservative pundit, O'Reilly gamely played along via satellite feed. Stewart prompted O'Reilly with a series of hypothetical scenarios. Sample scenario: "Would you pay $4 for a shrimp if it were wrapped in a $10 bill—netting you a profit of $6?" O'Reilly's response: "I would steal the $4 shrimp, and then donate it to the Occupy Wall Street folks so they know what the one-percenters eat." The epic game escalated to absurdist heights—Stewart involved Adolf Hitler in one shrimp scenario—but you can guess who won the final round.